Transfer Board with handles. 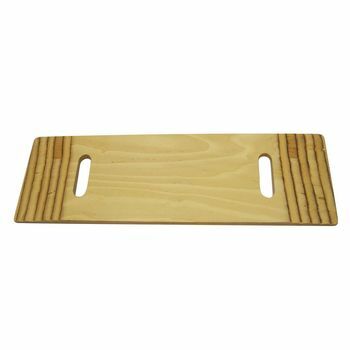 This laminated wooden board is used to transfer a patient from a wheelchair to a bed, chair or other location while avoiding strain for the carer. The top is varnished to facilitate transfer and the ends are thinned to slide under the patient. This board has a handhole cut into both ends for easier grip.